They are calling her “angel baby,” a newborn abandoned in the Lenana forest on the outskirts of Nairobi, Kenya last week. The 7 pound 4 ounce baby girl had been placed in a plastic bag and dropped in the woods without nourishment or water. There she lay for perhaps two days, starving, her umbilical cord infected. She must have cried out, but along the busy road that bordered the forest, no one was listening, nobody heard. Well, almost no one. The dog— mixed breed, no name, probably a stray— was likely out foraging for a meal. She’d just given birth to a litter of puppies and they were hungry. Now, this story could have taken an unfortunate and grisly turn but, remember, we’re talking about a dog. These are creatures who have shared our lives for at least 12,000 years. There is a bond. Was the canine mother moved by the plight of this human infant? Was it just blind instinct? Whatever the case, she carried the little girl back to her own litter, caring for her as best she could. That’s where the child was ultimately found: nestled amongst a pile of puppies under the watchful eye of the mother dog. She was taken to a local hospital and is now doing fine. And the dog? Well, dozens of Kenyans are visiting her home, bringing food and medication. One person has even offered to feed the dog until the day she dies. However skeptical you may be about the intelligence of non-human animals, it would be hard to argue that, in this case, a dog— and a hungry stray at that— didn’t act more responsibly than at least one human. Going to the dogs? Well, maybe… if you’re lucky. 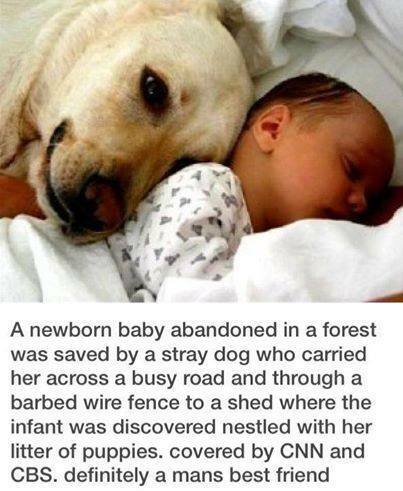 This entry was posted in Miscellaneous and tagged Stray Dog saves Baby!. Bookmark the permalink.